I finished the back and both the front panels this weekend and I am loving the way it is turning out! 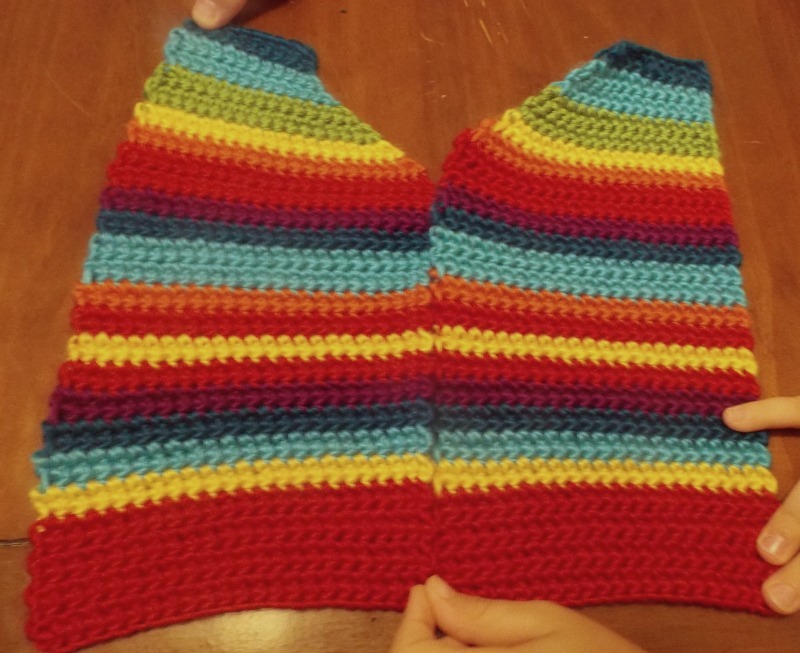 Since I am using a much smaller crochet hook, mine is starting to look a little different that the original post located here: Toddler Rainbow Sweater. I had to make some adjustments for the length as G1 is starting to get long, even through she’s still smaller than your average 2 year old. Before I go on, I much apologize for the color state of the images – it was getting on to evening and sometimes my house really blows when it comes to lighting. I’ve done the best I could, with what I had and with the help of picmonkey. The biggest issue I had, and again, it’s not a fault with the pattern, it was all me, was forgetting 4 lines in the front left panel and spending about and hour wondering about it. Once I figured out my problem, I briefly flirted with the idea of pulling it all out again and decided not to. I simply wrote out what I was doing as I did it, so I could mirror the pattern. I don’t think I did too badly really! Thanks to N1 and DH for holding down the rolling corners for me. I am considering making a quick video on how I joined the different colors and stopped having to weave in the start and finishing threads. I get bored with that real quick. 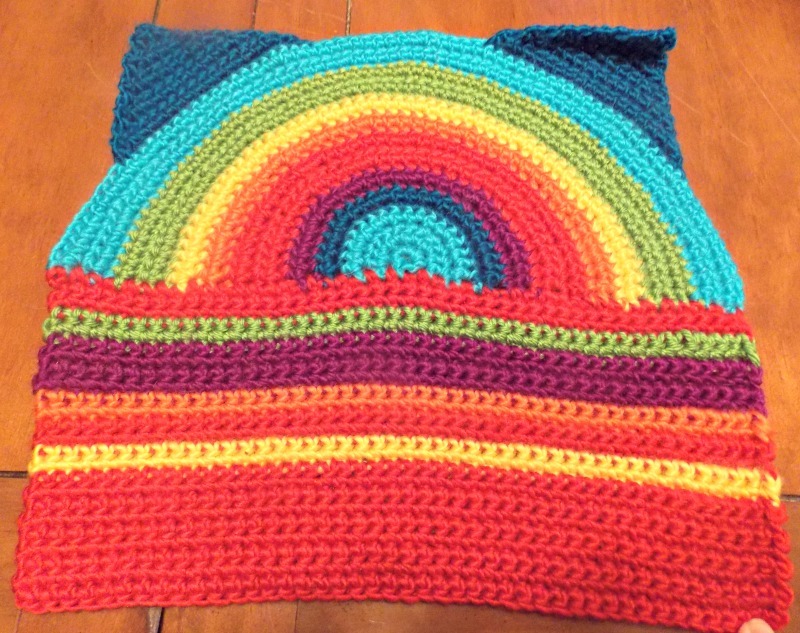 In a nutshell: In the last Sc, as directed, I join the next color with a slip stitch. Then I do the chain 1. 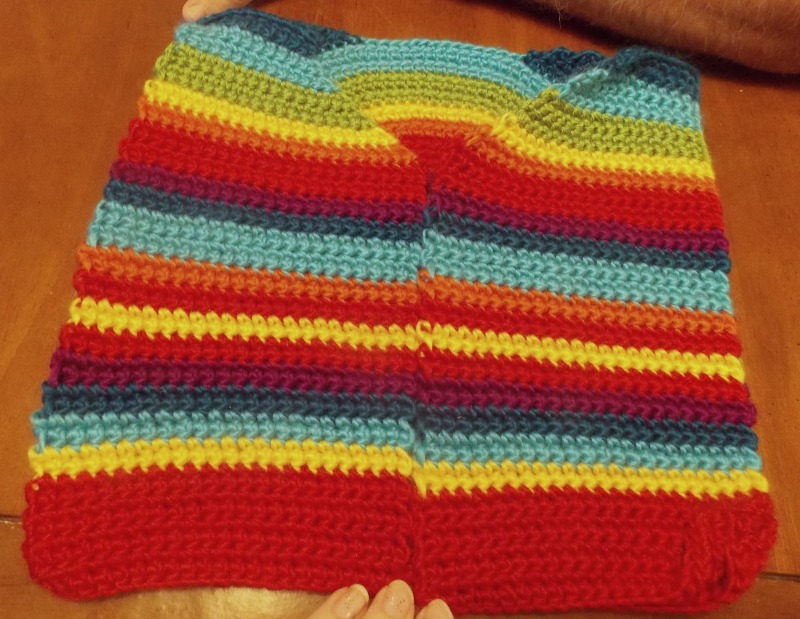 Then I grab both ends of the thread I am using, bring them both up to the top of the crochet. 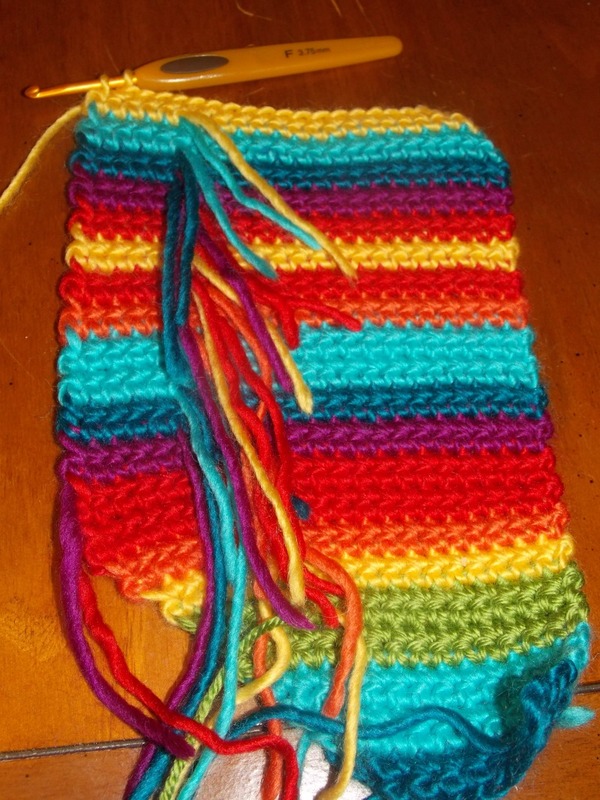 I then take the hook, go over the top of them, under and through the last sc of the previous line, yarn over, pull through and complete the first sc for this new line with the new color. I repeat this about 8 times and then push the remaining threads towards the wrong side of the crochet and continue on along the line. It ends up looking like the picture above. Was that clear? Maybe I will make a short video that shows it better – I am a better visual learner and maybe you are too!